How did you learn to build bikes? Mostly I learned at Seven Cycles out of Boston. I had been a bike messenger for many years. When I moved to Boston I was hanging around with people who worked at Independent Fabrication when they were still located there. I started to get really into the idea of frame building. I’d never seen anything like that before. I found out about Seven and they happened to be hiring entry level positions. I knew about bikes, but my fabrication skills were about zero at that point. I’d taken a couple of welding classes and barely, barely gotten my feet wet with metal work. I blindly sent my resume to Seven for an entry level finishing position and they hired me. I started out doing basic stuff like polishing frames and a little bit of light machining. I was always enamored by the welders and wanted to learn how to do everything. I expressed that to my superiors. I’d taken to finishing really quickly so they said, “if you want to learn how to weld, why don’t you get someone to teach you and you can practice on the side whenever you want.” I got someone to show me the very basics and I started coming in early every morning to weld on my own for an hour or so. I did that for a year. It took me a long time, but I learned to weld on titanium, which most people don’t do. It’s a little less forgiving than steel. After about six months of practicing, I was working in the finishing department still, but started training part time in welding. It’s hard to get a welding job there because no one ever quits. But at some point the timing was right. I had started to get pretty good at it and a welder quit. I became a production welder and was welding frames pretty much all day every day for four years. I started wanting to learn other things so I learned a little more about machining and design aspects, cutting tubes and the math and geometry. Someone quit in the machining department so I took his spot and was going back and forth between welding and machining and even doing a little bit of finishing. After a couple of years, I’d learned all the stuff and was filling in wherever they needed me to be. I thought, huh, I can do all of this now, why don’t I make a couple of frames for myself? That was over the course of eight or nine years. It didn’t happen over night. When did you decide to leave Seven and start Saila? Lauren Trout in her shop in Austin. Photo by Michael Johnson. I started doing Saila on the side about five years ago. I was still working at Seven most of the time. At first I was just doing it to see what would happen. I made a frame for myself. Then I made one for another friend and another. People started asking me for them, but I wasn’t really serious about it. I was just doing it as a side project. But over time I started thinking this is pretty cool, maybe I want to do it for real. I still wasn’t busy enough to quit my awesome job. I just slowly ramped it up over a few years. I got my own shop space after a year or two of just making them at Seven. I got my own equipment and space and got a little more serious about it, ramping up and ramping up. About two years ago I decided I was going to move back to Texas cause that’s where I’m from originally. That’s when I built it up and made it more official. I just moved back to Austin in August of last year and that’s when I started full time with Saila. I was taking a slow road for a while, but now I’m full-on, full-time doing my own thing. 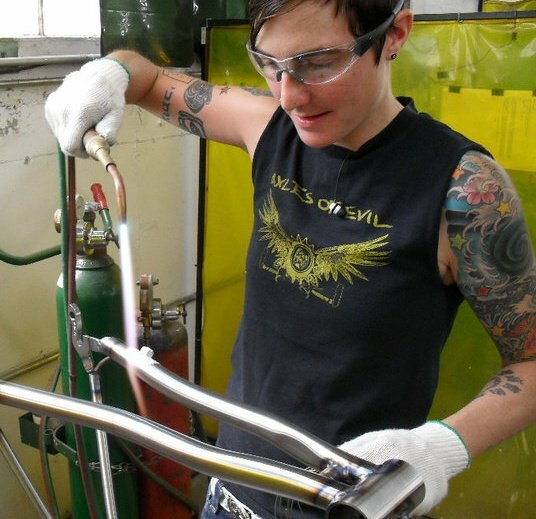 What’s it like starting up a one-woman shop versus working with Seven’s production model where everyone’s working on a piece of a given bike? They each have their own merits. I kind of like both in a way. I like doing my own thing. It’s a little daunting when everything is on you all the time. I can go home from work, but it never really leaves me. It’s my whole life. But I like having all the control. I like being able to work one-on-one with the customers. A lot of my business is local to Austin. I’m trying to focus on having a very personal relationship with my customers–have them come to the shop, meet them, talk to them. Sometimes they come watch part of their bike getting made. When it’s done, I get to see them see it. That’s quite different than working in a production facility that’s making so many frames every day, week, year, that get sent all around the world. I loved working there, but I made thousands of bikes in the my time there and I saw maybe three people ever face to face that rode something I made. It’s nice to have a very one-on-one personal experience and get that out of what I’m doing now. People so often just name their frame building companies after themselves. What does Saila mean? Well, my name is Lauren Trout, so I’ve had a lot of nicknames over the years. I didn’t want it to just be my name, so I was trying to think of something similar. I didn’t want it to be totally arbitrary. I kept thinking of all these nicknames I’ve had. They’re all sort of aliases of mine. I thought maybe I’d call it Alias, but decided that was dumb. So I landed on alias spelled backwards. I wanted to make up a word that looks nice, but nobody else will ever have. Usually when I spell it out like that people get it. Ohhhhhhhhhhhh. I see it now. Do you specialize in a particular type of bike? 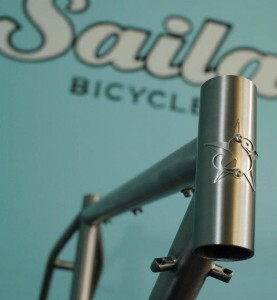 Saila specializes in titanium bikes. Photo via Saila Bicycles Facebook. Since I worked at Seven for so long, my background is mostly in titanium, so I’m trying to focus on that as a material. I prefer to work with it, I love the way it rides, and there aren’t nearly as many people doing it in general and isn’t really anyone doing that around here. I’m making mostly road bikes, track bikes, touring bikes, cross bikes, any sort of road-affiliated bike. I’m not really making mountain bikes or fat bikes because I have more of a road background. Mountain bike stuff’s just not what I’m used to. Basically titanium, road-ish bikes are my jam. Jumping further into your background, tell me a little more about your time as a messenger. How did you get into that world? I started working as a messenger when I was really young. I was living in Houston and going to University of Houston part time. I’d been working in restaurants mostly. My mom used to work downtown and I went to pick her up for dinner one day and there was a bike messenger on the corner. It was the late-90s so there wasn’t the messenger culture in the mainstream back then as there is today. I thought that seemed like a cool job and I was sick of working in a restaurant. I asked my mom, “who are those guys? How do you get those jobs?” She was like, “I don’t know, but I’ll find out.” I looked in the phone book and called up some crappy company and they hired me as a rookie. That’s how it goes, you know? It seems like there are a decent number of frame builders out there who have at least some messenger background. Yeah. It’s really cool to see. There’s a few former messengers who are frame builders. Megan Dean of Moth Attack is one. Chris Bishop. Sacha White of Vanilla. There are others I can’t think of at the moment. I loved being a messenger and having this little messenger family all over the world. I’d go to the big events and meet people from all around. It’s really cool to see other people to get out of the messenger game. Not that there’s anything wrong with it, but it’s cool to see people expand and do something a little more stable. It’s nice to go to NAHBS or some bike event and see all these people you know from a different background and still being connected to those roots. It’s great that years after being a messenger you’re still connected to this little world. 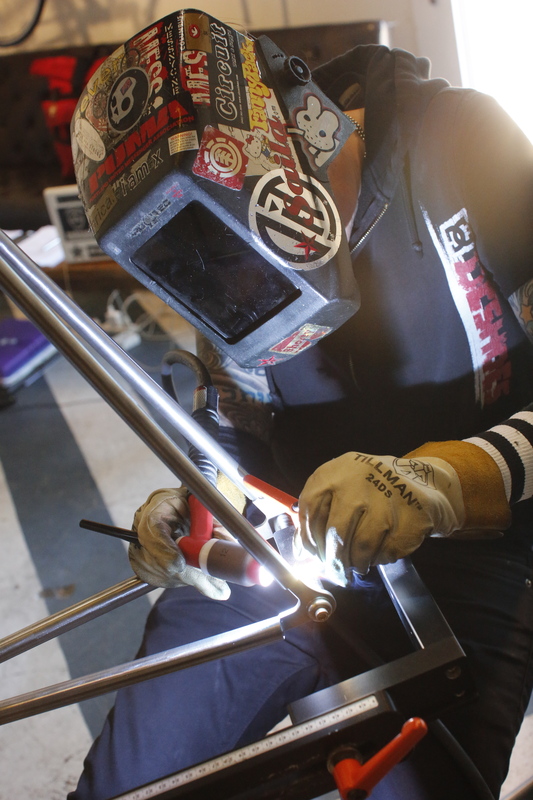 Vaguely related to messenger culture, the tail end of the fixed gear boom led to a wave of people taking a frame building class, starting a company, fading out shortly thereafter. It seemed like there was an explosion of custom bike builders starting companies, many of them who didn’t really know what they were doing. Do you feel like that trend has slowed down? Or are there just as many companies as ever building custom bikes? Lauren Trout in the Saila shop. Photo by Michael Johnson. I’d say it’s still going. It’s kind of a touchy subject. It’s kind of like being a messenger actually. People like the style and think it’s cool to ride a bike every day, but they don’t know how hard it is and all the crap you have to go through. It’s not a glamorous lifestyle. In the same way, there are kids who are like, “you can make your own bike, that’s awesome!” like “how hard could it be?” basically. So they go take the class at UBI or Yamaguchi or somewhere, which is a good thing to do. But people don’t realize this is a craft that takes a long time to figure out. You can make your own bike after you take the class, of course. But it’s kind of like how I can come home and cook a meal, but that doesn’t make me a chef. It takes a long time of making mistakes and learning what to do and what not to do to be good at anything. I think people get a little overzealous about it. Then they start doing it and they realize it’s really hard and it’s really hard to make money and it involves all this equipment. Having a shop space and all that isn’t cheap if you want to do it right. Even paying for insurance and all that kind of stuff is really expensive. If you really want to do it you have to be all in and it doesn’t take too long for people to figure that out. I feel super lucky that I got to have such an in-depth experience at an amazing company like Seven. It’s pretty rare that anyone gets to learn frame building the way I did. And even with that, I’ve been doing this for almost 10 years and I still make mistakes and there’s still stuff I don’t know. It’s a constant learning process. Just going after it without really knowing what you’re up against isn’t a great idea. I hate to be discouraging. I get emails and phone calls all the time from people asking me for advice on how to be a frame builder. I’ll answer any questions people have. I don’t want to tell them, “don’t do it.” But I feel like I have to be as realistic as possible. I try to be encouraging. I want everybody to win. I want everybody to do what they want to do. But you have to be careful about how you go about it. Just because you know how to make a bike doesn’t make it safe, doesn’t make it a quality product, doesn’t really make it anything. It’s interesting that you still get calls all the time from people. From my outsider perspective it seems like there’s been a little bit of a slow down in the number of new companies popping up or the popularity of NAHBS. I think that’s probably true in a way. I know especially with NAHBS it’s been looking a little bit different lately. And maybe it’s that these new people aren’t actually making real companies after all. Maybe they’re just tinkering around and making a few bikes instead of going full on. It’s interesting just to have a different perspective about that. Do you feel like the market for custom bikes is still strong? Yeah, actually. I don’t see that slowing down at all. It’s pretty reassuring. Since I’ve moved to Austin I’ve gotten a lot of good feedback. It’s a little different, especially coming from New England where there are so many custom frame builders. It’s fairly saturated up there. Down here there are a couple of small custom builders. But there’s not much. So people I’ve met seemed to be super into the idea of buying local, buying custom. They like the one-on-one aspect of it. I feel like I’m going to do really well here. I haven’t even been here for very long and it’s taken off quicker than I thought it would, which is good. I know you just moved to Austin and went full time, but do you have thoughts about where you want to go from here with the company? I don’t know exactly. I’m kind of feeling that out as I go along here. I definitely want to keep it small. People ask me a lot about expanding or hiring people. I hope to be big enough to be busy and support myself and be comfortable. But I don’t really see myself expanding too much. At most I may have one or two people working with and/or for me. Other than that, I have no dreams of having some large company or going into production status. I want to keep it small and personal. 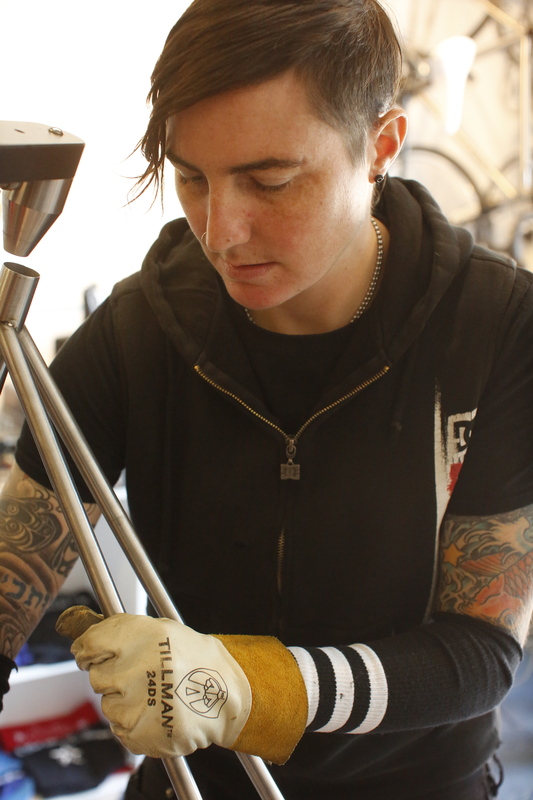 This entry was posted in Bike Industry, Frame Builders, Interviews, Messengers and tagged austin cycling, austin texas frame builder, bike messengers, custom bicycles, lauren trout, new england frame builders, saila bicycles, seven cycles, women frame builders. Bookmark the permalink.